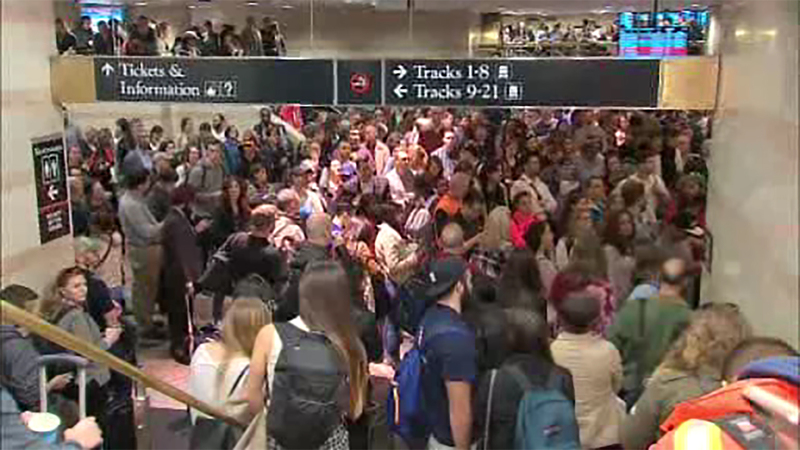 NEW JERSEY (WABC) -- Some New Jersey Transit riders frustrated over recent service problems are taking part in their own form of May Day protest. Commuters have been handing out fliers and posting on social media, urging riders not to purchase May monthly tickets Monday in what is being called 'NoPayMay'. Instead they suggest using their April monthly passes. Organizers say the movement comes after weeks of delayed and cancelled trains, with more train troubles expected. Derailments on March 24 and April 3 caused delays up and down the corridor between Boston and Washington, D.C.
On April 14, a NJ Transit train became disabled in the tunnel leading into the station, stranding passengers for three hours and causing more havoc. Accelerated track repairs at New York's Penn Station in the wake of the recent derailments will require two or three "significant" disruptions to weekday service this summer, Amtrak's CEO told lawmakers Friday.